If you are anything like me, your dogs are your life. You couldn’t imagine taking any family, engagement, or wedding/elopement photos without them! 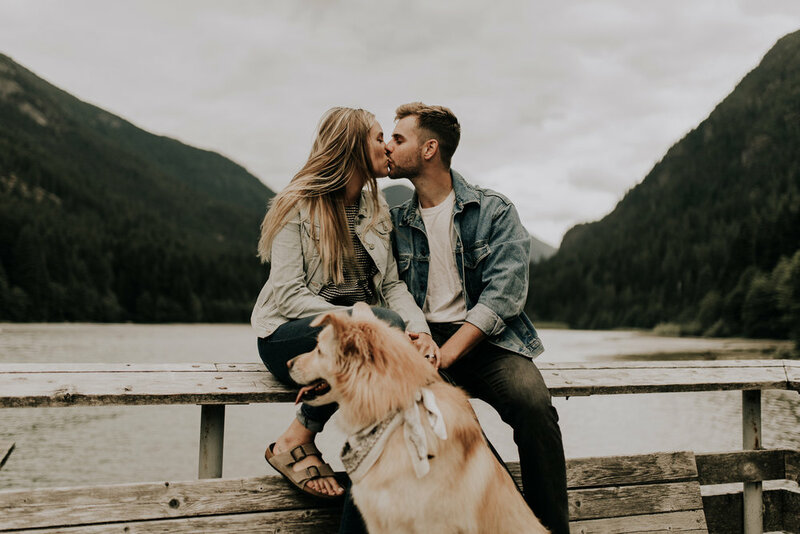 Since I have two big fluffy pups of my own, and have had quite a few photoshoots as well as elopements/wedding with dogs, I have curated a few tips and tricks for those of you who don’t want to leave your four legged friends at home! Taking photos of dogs is just as bad if not worse than taking photos of a two year old. They don’t exactly understand what is going on so obviously they may act out. Especially if they aren’t used to being in the location you have chosen for your photos. But, if you bring their favorite treat we may be able to distract them from their surroundings long enough to get a good photo! I do make lots of crazy high pitched noises (consider this a warning) to get them to look, but it doesn’t always work! So make sure you stock up on your dogs favorite treats before our upcoming shoot! If you take your dogs on a hike or even play fetch with them a half hour or so before your shoot at the location we will be shooting at I promise they will be more likely to cooperate! Especially since it will familiarize them with the area as well as wear them out. An anxious dog that has been sitting in the car for however long seeing a new place is 100% not going to cooperate as much as a dog that is worn out, and has already gotten all the smells within the area. You know they have to get those smells! Even though we love our furry friends very much, we don’t want them in every single photo. (even though you may be thinking “yes I do want them in every photo!”, the photoshoot IS about you two! I promise you won’t regret it.) Especially if they start to get fussy. I try and do a lot of candid things with movement to keep them intrigued, but it doesn’t work with every dog! So, I would recommend if your dog does not do well off leash, to bring something to tie them up (like paracord to tie the leash to a tree, or a tie out stake) and leave them with their favorite toy. Or maybe you have a super awesome friend or family member that would love to be designated dog wrangler! Offer to pay them in food or beer, I mean who would pass that up? Puppy time and beer?! Think about buying your pet a new ascetically pleasing collar or leash. Some people even have their dog wear a flowered collar (if you want this please let me know because I will totally make you one!! ), bowtie, or even a bandana. This is not necessary but would add a nice touch to the photographs! This may sound silly, but your dogs totally feed off of your vibes. If you are stressed out they will be too! Don’t worry I shoot 7+ frames per second, so even if they sit still for one second I bet I got the shot already! Just remember to have fun and trust the process! If your dogs won’t cooperate in one specific pose, we will move on to something different! I want your photos to represent you and your fur babies so I’m not going to make them do something they are not comfortable with! Reward them afterwards with their favorite activity, food, or toy! Being a model is NOT easy!